A man paints a house on NW 15th Street in the Heritage Hills neighborhood of Oklahoma City Tuesday. If an Oklahoma homeowner wants to make some repairs on their own, they may be breaking the law. New bills in the state legislature would change that. Senate Bill 104 and House Bill 1412, sponsored by state Sen. Dan Newberry, R-Tulsa, and state Rep. Mike Osburn, R-Edmond, would allow single-residence homeowners to do construction, repairs, installation and other work to their property. Homeowners would still need to get the proper city permits. 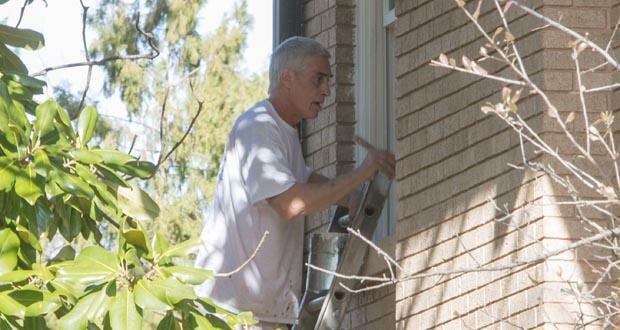 State Sen. Dan Newberry, R-Tulsa, has spent the last few years hearing from people who want to make their own home repairs. He said he heard from a woman who took out the proper permits to repair her bathtub, but the city inspector wouldn’t give her approval because it was not done by a licensed professional. She had to hire a plumber to do the work so an inspector would approve it. Another person – a retired electrician – couldn’t even get the inspector to say if his home’s new electrical work was done properly. The homeowner wasn’t a licensed professional. “The guy asked the inspector where it was in the statutes, and the inspector said, ‘It’s in the part where I say you have to have an electrician,” Newberry said. In his weekly conversation with KGOU, Journal Record editor Ted Streuli says landlords who self-manage their properties and DIY homeowners would benefit. “In a lot of cases, they’ve really been breaking the law all those years if they were doing any electrical, plumbing, roofing or other work that would require a vendor to be licensed, and in cases that could even include painting,” Streuli said. Streuli says contractors who could potentially lose business have been speaking out against the bills, as well as some architects. “They’re really worried about the potential for shoddy repairs that could affect either a tenant or the next owner,” Streuli said. JACOB MCCLELAND: Ted, why is Russell Evans confident that Oklahoma will move out of a recession and into recovery this year? TED STREULI: Well, Evans told us he thinks Oklahoma will benefit from upticks in both the energy industry and a seemingly improving U.S. economy overall. And so he told us the local turnaround is expected, he thinks, in late spring or early summer, and that everything should feel much healthier again by the end of 2017. MCCLELAND: Now the Federal Reserve plans to raise interest rates this year. Will that have any kind of a ripple effect into Oklahoma’s economy? STREULI: Well, it will in Oklahoma’s and probably everyone else’s. Evans told us we will likely see a 2 percent inflation rate as a result of the change in inflation rates. He also told us, though, that the Federal Reserve’s policies the last four or five years have accomplished what they set out to do, that they really drove liquidity in the stock markets and that stock prices may be overvalued, relative to economic conditions, but not to monetary policy. MCCLELAND: As the economy moves here to recover, should state and municipal leaders expect revenue to actually grow this year? STREULI: Well, at some point we should see that. By Oklahoma City’s five-year projection for their general fund revenue, compared with city expenditures, suggests that they’re going to have to close about a $51.5 million gap by fiscal 2022. On the other hand, Gov. Fallin announced some proposed tax policy changes this week in her state of the state, and could have a dramatic effect on cities. There’s also some legislation working its way through that could really help city finances, and all of those variables are going to come into play. MCCLELAND: I want to move to the state capitol for a little bit, Ted. A new bill would allow homeowners to make their own repairs to their homes. First, couldn’t homeowners already do this? Or have all those do-it-yourselfers been breaking the law all those years? STREULI: Well, in a lot of cases, they’ve really been breaking the law all those years if they were doing any electrical, plumbing, roofing or other work that would require a vendor to be licenses, and in case that could even include painting. MCCLELAND: Senator Dan Newberry and Representative Mike Osborne introduced versions of this bill in both the House and Senate. What is their rationale behind it? STREULI: Well, certainly they think homeowners should be able to do their own repairs. You know, king of one’s castle, as it were. The homeowners would still be required, though, to get the appropriate permits and inspections. MCCLELAND: Who would benefit from something like this? STREULI: Homeowners, of course, but there would also be a really big boon to landlords who self-manage their properties because they would also be able to do their own repairs on those. MCCLELAND: Has there been any kind of opposition toward these bills? STREULI: Well, sure, as you’d expect there’s some opposition from contractors who would stand to lose some of the business. But architects have raised some eyebrows as well and raised some concerns. They’re really worried about, you know, the potential for shoddy repairs that could affect either a tenant or the next owner. MCCLELAND: We’ve been talking with Ted Streuli. He’s the editor of the Journal Record newspaper, and he joins us each week to talk about business in the state. Ted, thank you so much. It’s been a pleasure.